Rookie card is a term that has evolved over time and can ultimately mean something different for every collector. It can also elicit some very passionate debates. 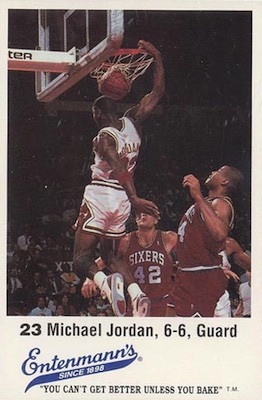 When talking about someone as massive in the hobby as MJ, it is not a shock that collectors covet multiple Michael Jordan rookie cards in their search and not just the issues from Fleer. The following guide aims to document the earliest Michael Jordan cards so collectors can decide which option works best for them. 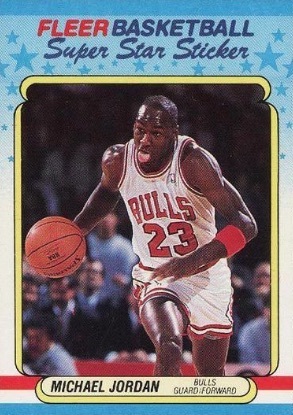 The 1980s were a wild time for basketball cards and that is clear based on the top brand of the era essentially abandoning the sport, and compounded by the time it took for the "official" Michael Jordan rookie card to be released. However, the collecting world always seems to find a way to fill in the gaps, you just have to know where to look. 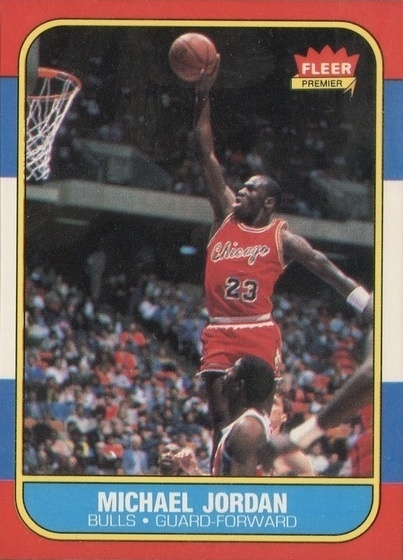 Beginning with Star Company, multiple cards pre-date the iconic 1986-87 Fleer Michael Jordan rookie and several other notable 1980s Michael Jordan cards followed it. 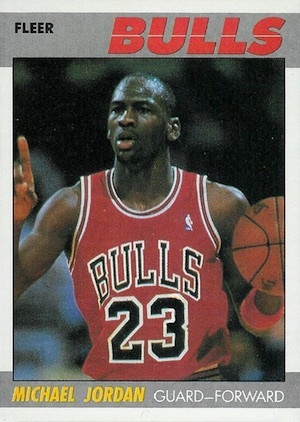 Shop for Professionally Graded 1980s Michael Jordan Cards on eBay. 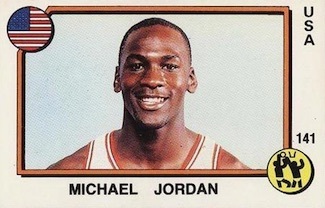 The list below highlights many of the earliest Michael Jordan cards. Because of Jordan's legacy, quite a few unlicensed cards have also popped up, alleging to be from the same period, but these are mostly worthless custom cards. Although it is not a list of every single card from the decade, the key Michael Jordan rookie card options and other notable 1980s editions are all shown below. 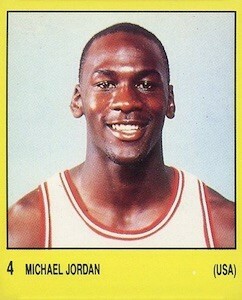 Are there are any other 1980s Michael Jordan cards that have earned in a spot in your collection? Let us know in the comments. Click on the card titles or images to shop for specific cards on eBay or check market values. When available, bolded sets in the descriptions go directly to product profiles or articles. 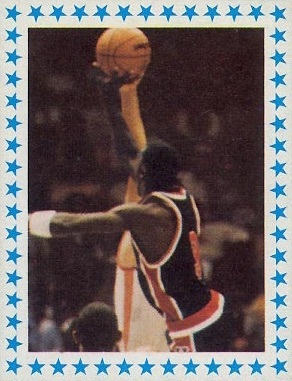 Fleer might get most of the recognition among Michael Jordan rookie cards, but Star Co. was the first. Although quality and authenticity remain a concern, the 1984-85 Star Company card dubbed XRC is finally starting to get considerable respect in the mainstream hobby. Qualifiers and semantics aside, this is the true rookie for Michael Jordan even if it is not the "official" one. 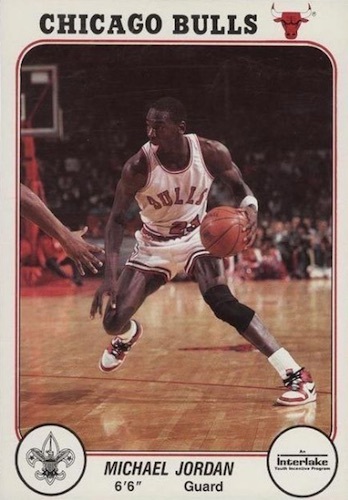 Not only did Star bring collectors the earliest basketball card for His Airness, they also produced the most Jordan variety of the decade, with several MJ cardboard options issued over several years. However, the red-framed #101 card is the most sought-after and valuable of the bunch. Jordan also has a blue-framed Rookie of the Year card from the same release. Graded is the recommended route and BGS is the only major company that offers these services for Star cards. Issued by the Boy Scouts of America via the Interlake Youth Incentive Program in the Chicago area, this oversized Michael Jordan promo card is part of a set that documented the Chicago Bulls lineup. The blank-back card is quite limited given the regional release and counterfeits are not uncommon. The striking look of the 5x7 card is further amplified by the large canvas for Jordan and his well-known, tongue-wagging ways. Depending on how you define a card, several of these might walk the line for some collectors, this Nike "Jumpman" promo included. 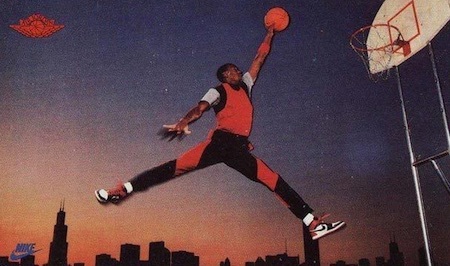 The amazing picture of Jordan dunking across the Chicago skyline is boosted further thanks to the affiliation with his popular shoe line. Produced as a promo for the Air Jordan signature sneaker, the large card actually has a traditional card back, giving it a more customary look compared to many of the other early issues. Buyer beware, as there are a ton of reprints for this card. Be extra careful when dealing with ungraded examples or those graded by less-reputable companies. An oddball collectible for sure, but the 1985 Prism-Jewel is easily the most eye-catching of the 1980s Michael Jordan cards. 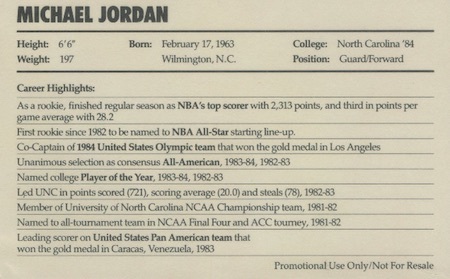 Part of a 14-card sticker set reportedly issued through vending machines, the dual player drawings for Jordan are joined by his facsimile signature and a Superfrator-like finish. Backs are blank but, as many were stuck to a surface, they are not the easiest to track down in decent condition. While options were limited stateside, adventurous collectors could have traveled to Spain in 1985 and 1986 to get their Michael Jordan card fix. It would be easy to miss that it is even Jordan pictured, as the image is of his back. 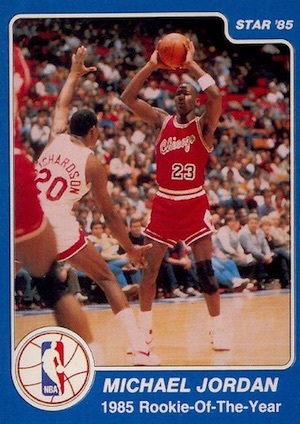 The vibrant look of the 1985-86 Merchante card showcases a young MJ putting up a shot with blue stars surrounding the border. Collectors can find the card with two different ad variations on the back. 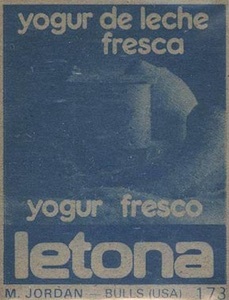 Although they are both yogurt advertisements, one features red ink while the other is heavy on blue. 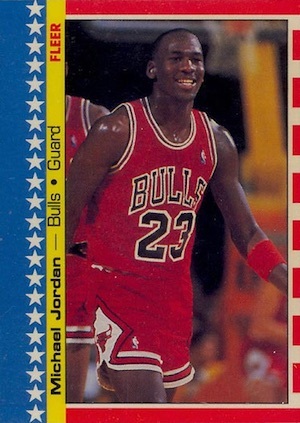 There is also a 1986 version (#163) that adds an additional profile image of Jordan on the top along with red and blue stars. 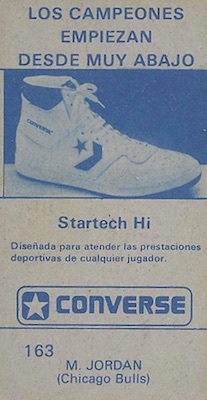 This time, the ad on the back is for Converse. 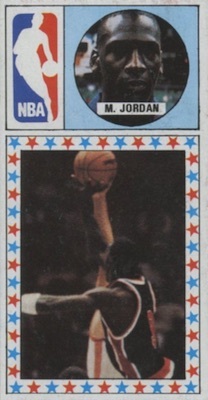 Unlikely to need much of an introduction, 1986-87 Fleer is the home of the Michael Jordan rookie that immediately comes to mind for most collectors. It is also a virtual lock on any collector's list of the top Michael Jordan cards of all-time. A colorful border and dynamic image of Jordan make it clear why this card carries such clout in the hobby and is the undisputed king of the Michael Jordan rookie cards. The set also offers a sticker insert for Jordan that checks in at a lower price, but can still be very valuable on its own. 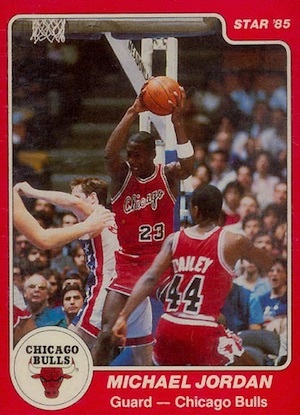 Like many of these early Michael Jordan cards, fakes can be a problem for the primary rookie, so be careful with raw versions. Another non-traditional set comes courtesy of Entenmann's. Widely known for their baked goods, the company was also involved in promotional team sets for the Bulls near the end of the 1980s. 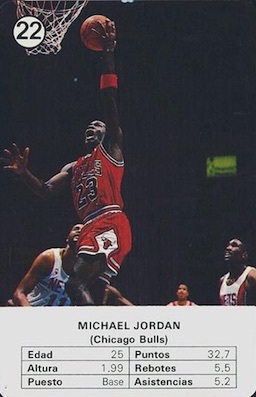 Featuring similar dunk images of Jordan, the 1987 and 1988 editions can both be seen below. Scottie Pippen was also part of both sets. Treating collectors to more international releases, the 1987 Panini Supersport stickers for Michael Jordan are found in both a yellow Spanish version and white Italian edition. 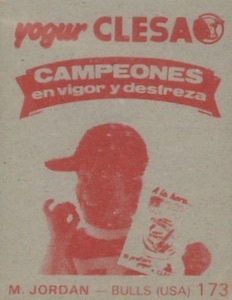 While the Spanish card has a standard back with the card number noted, the Italian issue comes with either Tita or Giuseppe Lorenzo (both are soccer players) on the back. Following up a legend is never easy and that is what 1987-88 Fleer had to endure. Not as distinct as the 86-87 set, the sophomore Fleer Basketball has slowly built up credibility with collectors and this Michael Jordan card leads the way. 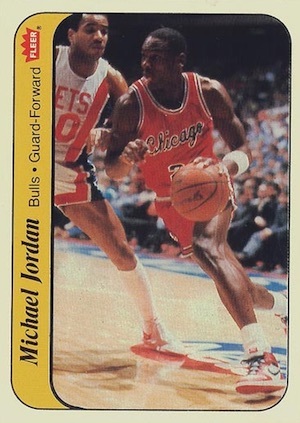 Part of our list of the Top MJ Base Cards of All-Time, sealed boxes are actually very tough to locate and high-grade Jordan cards command a decent sum. A sticker insert for Jordan is also an option. 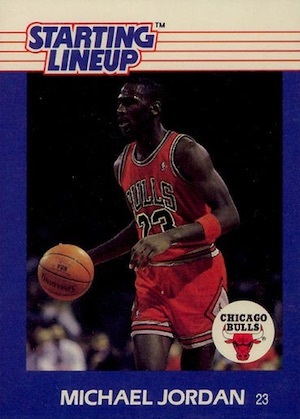 Perhaps not the first place for card collectors to look, Starting Lineup figures were very popular at this time and the 1988 edition for Jordan included a simple basketball card. It may not look like much but given the limited variety of 1980s Michael Jordan cards, it is a nice option if you are so inclined. 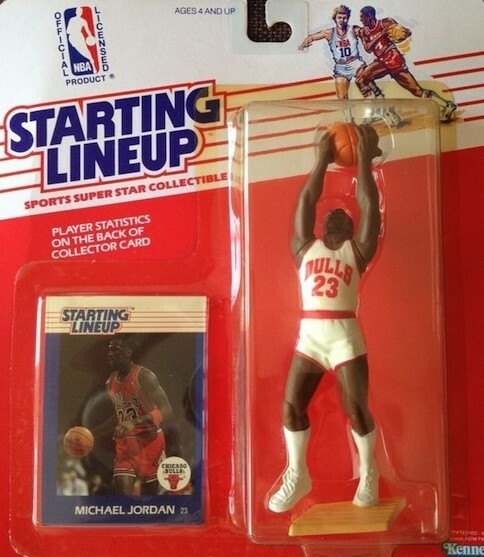 Obviously, the card is only one part of the equation and the original package included a Michael Jordan figure, as seen below. 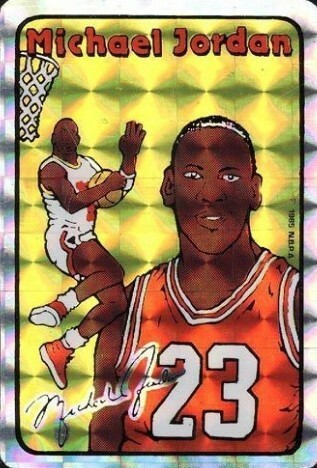 Fournier Estrellas is a Spanish release that brought collectors both a card game and sticker featuring Michael Jordan. 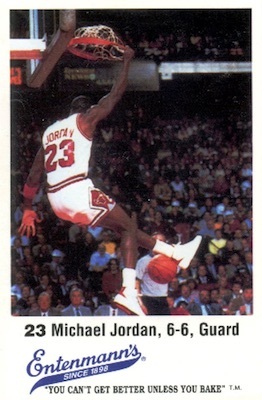 The game included a 33-card set that also showcased Jordan on the rules card. The sticker, complete with his receding hairline, came in individual wax packs. Another year further away from the legendary Fleer debut, 1988-89 Fleer finally had some notable rookies to speak of but Michael Jordan still sits at the top. Again, a sticker insert is available and made huge waves when a PSA 10 Gem Mint version sold for $24,350 in May of 2016. 1987-88 Fleer Michael Jordan GEM MINT Please Read! High End! 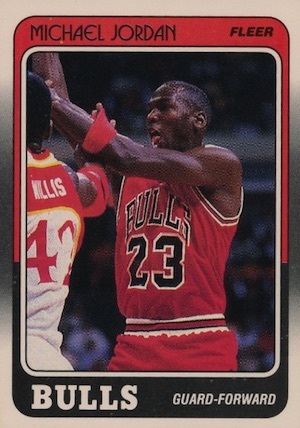 Question:: have a 1984 Star set 14 cards red of Michael Jordan. Where could I find more information about this set? 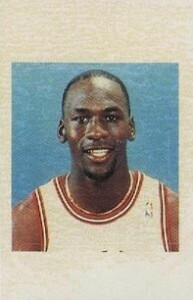 I have a Fleer Jordan rookie card. Where do I get this card rated. 1989-90 FLEER BASE CARD: MICHAEL JORDAN #21 PSA 10 GEM MINT !! BGS PRESTINE ? ?